Nokia Lumia 822 is a smartphone from Nokia powered by Microsoft’s Windows Phone 8 and is exclusively available for Verizon carrier. Nokia Lumia 822 is a variant of Nokia Lumia 820 and supports inductive charging through Qi technology and LTE. The device has a unique body design when compared with Lumia 820 and comes in Black, White and Gray colours. 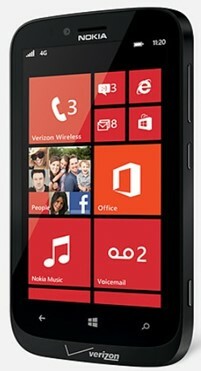 The Nokia Lumia 822 features 1.5 Ghz Qualcomm Snapdragon S4 dual-core processor with 1GB of on-board RAM and 16GB internal storage expandable MicroSD card support. The device also features 8 megapixel camera and 1.2 megapixel front facing camera and supports Verizon’s CDMA and LTE bands and includes various other features like NFC, Inductive Charging etc.